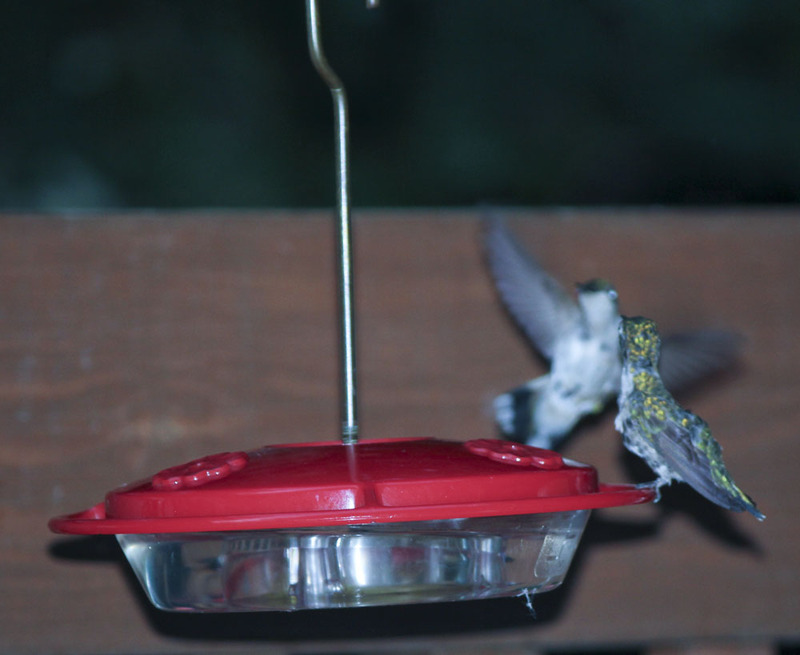 Two hummingbirds fight over nectar at a backyard feeder. This is not a great photo but it does show a little of what we have been witnessing on our backyard deck for the past couple of weeks. 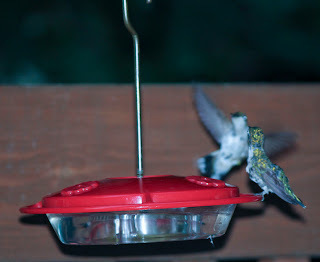 Two to three hummingbirds at a time will try to get to the red nectar feeder to eat. But no matter which one is eating, the other one or two will fly it off, which looks sort of like aerial dog fighting. No one is getting any calories -- or rest -- here. Since we were having our deck cleaned last weekend, I had to move the feeder from its regular place. I hung it from the upper deck and was happy to see that the birds found it. But the fighting didn't stop then either. So, just like a parent of two children, I thought we could get another small feeder and see if the hummers could each have one -- or most of one -- that they will leave each other alone. Naw, that didn't happen either. They are still fighting, but now have two places to mount their attacks. One bird is so territorial it just sits on top of the wrought iron hanger holding the feeder for minutes at a time. Whoever said humingbirds don't stay still long hasn't met this guy. I know we are nearing the time when the birds will begin their migration south. I worry that they will not have built up their bodies enough for the long trip since they are interrupting each other at the feeders all day long. Nature usually finds a way, so I am hopeful they will all be OK for their trip. I hate the thought of them leaving for months. Even when they fight they are still magical to watch.